Premiere of Alen de la Cruz’s “Bago Ang Kalayaan” at the Imus Sports Complex (photo: MAYOR Emmanuel MALIKSI Facebook page). The only thing that warmed up the air-conditioned stadium that windy evening of July 7 in Imus was the cordial smiles of its smartly dressed crowd. Frocked in Filipiniana attire, the guests were huddled to their seats by courteous ushers who themselves were dressed to the nines. Near the entrance, a four-piece orchestra filled the already festive air with classic Filipino favorites. Beside them were dioramas and artistic sketches of the Katipunan, the seditious group that ignited our country’s eventual breakup with Spain in 1898. All corners of the stadium were covered with black drapes to keep the entire stadium as dark as possible. At the farthest end of the stadium, the focal point of the seated audience was a wide screen. The entire Imus Sports Complex was virtually converted into a gigantic movie theater as a culmination of the city’s week-long cityhood anniversary. They were all anticipating their local government’s “labor of love” — the premiere of a docudrama recounting Imus’s celebrated Battle of Alapán. “Today, I just want to say that this project has been a long-awaited dream of yours truly,” City Mayor Emmanuel Maliksi beamed proudly during the brief press conference preceding the film showing. The young city magistrate has been planning for this for a long time. The fifth cityhood celebration of his beloved city was the perfect event to turn that dream into reality. Ask anyone where our flag was first unfurled and waved, and he will give you an immediate answer: in Kawit (Cauit), Cavite. That is the standard reply. Unless the person you ask is an Imuseño. To the natives of Imus, what is common knowledge to us is for them fable. Imus is not called the “Flag Capital of the Philippines” for nothing, for it was there where our national flag was first unfurled and waved. Mayor Manny’s film project sought to fight the fable. And to non-Imuseño visitors who attended the film showing, the press conference gave light as to why the city bears the flag capital tag. It was there, particularly in Barrio Alapán, where the flag was first waved, but as a war ensign. Imus in revolutionary history was a foretelling of the climax that was the Declaration of Independence. The docudrama, titled “Bago ang Kalayaan: Imuseño sa Kasaysayan ng Pilipinas“, sought to retell the importance of Imus and its place in Filipino History. Produced by the City Government of Imus and Infinidad Entertainment, the docudrama, helmed by fledgling director Alen de la Cruz, paid tribute to the city’s local heroes (José Tagle, Licerio Topacio, Hipólito Saquilayan, etc.) who participated in the rebellion against Spain as well as to introduce the Battle of Alapán to a much wider audience. Image: City Government of Imus. It is not widely known that, two weeks before Emilio Aguinaldo’s declaration of independence from Spain on 12 June 1898 in Cauit, the Filipino flag was first waved, in fact had its baptism of fire, in Imus. It was first used rather fortuitously in a grassy field just outside the población. This site was part of the sylvan barrio of Alapán. Historian Alfredo Saulo described Alapán as forested, but the name itself, an old Tagálog word which means a place where cows feed on grass, aptly describes how the barrio looked like at the time of the battle: it was then grazing grounds for cattle. As the story goes, the flag, freshly arrived from Hong Kong, was in the hands of Aguinaldo’s revolutionary army when it clashed with Spanish troops stationed at Imus on 28 May 1898. The battle lasted from late morning to mid-afternoon. Armed only with bamboo cannons and Mauser rifles, the Filipino troops engaged the Spanish army in a close-range fight. The flag was used as a war ensign, thus earning its literal baptism of fire even before it was unfurled in Cauit. After an intense five-hour battle, close to 300 Spanish soldiers surrendered and were taken as prisoners of war to Cavite Nuevo (now Cavite City). But is this claim accurate? Was the flag really unfurled or even used as a war ensign during the Battle of Alapán? 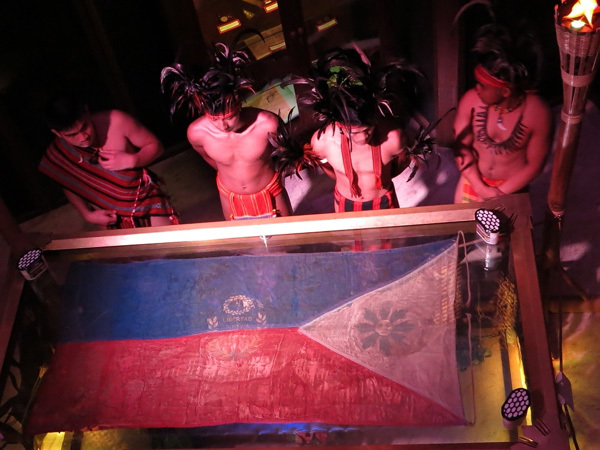 The first Filipino flag is conserved by the Emilio Aguinaldo Foundation in Baguio, Benguet (photo: Philippine Daily Inquirer). No less than our country’s eminent historian, Ambeth Ocampo, acknowledges this as fact. “It was first used in the Battle of Alapán in May 1898,” wrote Ocampo about the flag in his Philippine Daily Inquirer column “Looking Back“. Even before that, former President Diosdado Macapagal in 1965 issued Proclamation No. 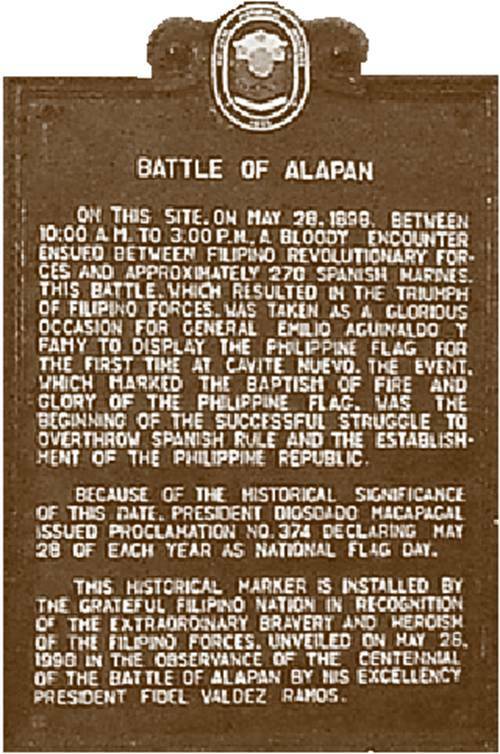 374 where it is stated that “our flag was first raised and received its baptism of fire and victory in the battle of Alapán, Imus, Cavite, on May 28, 1898”. That proclamation has since declared May 28 to be our country’s Flag Day. In 2008, the city government of Imus celebrated its very first Wagayway Festival (Flag-Waving Festival) to commemorate the first time that the Filipino flag was unfurled during the Battle of Alapán. The flag that Aguinaldo personally brought home from Hong Kong lent color to the Battle of Alapán, a forested barrio of Kawit (sic), on May 28. It was unfurled to commemorate the victory of the Filipino forces over 270 officers and men of the Spanish Marine Corps in a five-hour firefight. In writing the above, Saulo used Vol. 3, Exhibit 2 (pp. 7-8) of Taylor’s Philippine Insurrection as his source. But he failed to make it clear where exactly the flag was unfurled, even if just to fend off criticisms of vagueness. Further research is needed to compare the contents of Exhibit No. 71, Vol. 1 of the Philippine Insurgent Records against Vol. 3, Exhibit 2 of Taylor’s Philippine Insurrection. Until then, this leaves us with which flag fable should be unfurled and fought, to be finally forgotten. The belief that the Filipino flag was first raised in Imus has been enshrined in the hearts and minds of the Imuseño for years, so much that it has become an inseparable part of the local identity. The entire floor of the city plaza, for instance, is painted with a huge symbol of the waving flag which can be perceived perfectly from the air. At the exact site where the battle of Alapán had been waged stands a 90-foot pole where one of the largest Filipino flags is waving mightily against the rural breeze. Citywide festivities compel Imuseños to display flags in front of their homes. So fervent is this Imuseño zeal towards the national emblem that, minutes before Bago Ang Kalayaan was to be shown, everybody immediately stood up when the national flag appeared on the screen. With their right hands upon their breasts, they patiently waited for the national anthem to blurt out from the speakers. About a minute later, everybody was chuckling back to their seats. It turned out that what was being shown at that moment was just a short video for the Flag and Heraldic Code of the Philippines. Pretending to be from Imus, I joked aloud to my wife: “This is how we Imuseños show our love and respect for the flag!” That the mere sight of it compels Imuseños to stand in salute. Most, if not all, municipalities and cities in our country bear distinct nicknames that reflect their unique identities and histories. Usually, such nicknames are rooted on a particular place’s prominent environmental features (Puerto Princesa: The Eco-Tourism Capital of the Philippines), economic renown (Macati: The Financial Capital of the Philippines), cottage industry (San Pedro Tunasan: Sampaguita Capital of the Philippines), successful tourism branding (Bacolod: The City of Smiles), and so on and so forth. It appears that the so-called search for national identity has permeated each and every unit of local government. Each city, every municipality, even barrios and sitios, wanted to showcase its own uniqueness, not for the sheer desire of becoming famous but simply to let the world know that it exists, that it has an exceptional story to tell, that it is not just another place that one passes by or mentions dispassionately. Because a dispassionate reception from outsiders makes its people all the more passionate —to the point of zealousness— to burst out from the flames of existence itself, that it is its own being, as if distinct from the very country that cradles it. Is this zeal, borne out of that national identity crisis, a curse or a blessing to our local government units? De la Cruz’s docudrama itself is reflective of that zeal. Imus, clamoring for its own identity, that it is as historic as Cauit and Manila and Malolos, showcases its local heroes who participated in and contributed to the flowering of the uprising against Spain. The Battle of Alapán is its climax; its denouement, that the raising of the flag in Cauit was all but anti-climactic. But even before all the action had unfolded in de la Cruz’s dramatic structure, the documentary’s exposition itself was “anti-expository” in the sense that it made a simplistic approach to what had caused the Katipunan revolt. At the start of the story, we see actors portraying Spanish soldiers and Filipino peasants, the former physically mistreating the latter. This clearly sets the tone of the whole narrative: the waving (no pun intended) of the leyenda negra. To a non-historian viewer, this brings him back to classroom and textbook fodder that has proselytized the execrable black legend for decades. The expository didn’t expose anything new that would have raised the standard of quality historical documentaries. Although Bago Ang Kalayaan introduces something generally novel, that of the first unfurling of the flag, it would have been developed further had the story strayed away from emotional appeals and have instead given much justice to the Katipunan’s raison d’être: that its predecessors —from Luis Rodríguez Varela and his Hijos del País all the way to Marcelo del Pilar’s propaganda movement— have lost all hope on the reforms that they were trying to push. After all, the Katipunan, for all its faults and good intentions, was born out of a lingering disappointment on Spanish political policies over the islands. To show that a Spanish soldier beating up a Filipino peasant in a docudrama was too simplistic a cause for the Katipunan’s founding and is far from being political (not that such a thing ever happened, but if it ever did, it would had been isolated at best and would still not had been a major cause for revolt). While the polo y servicios and the bandala —both of which were not entirely malevolent— were mentioned, they were not enough to justify the dispiriting opening scenes of Bago Ang Kalayaan. Indeed, there is much to be unraveled about the Katipunan, how and why it came to be. But since de la Cruz is no historian, we only have her film’s scriptwriter to blame. During the Spanish times, we have to consider the fact —and I am speaking from a legal standpoint— that the Katipunan, the wheel upon which Aguinaldo’s revolution against Spain (and later on, against Uncle Sam) rode on, was a criminal organization. It doesn’t matter if they are considered as heroes and patriots today, and whether or not their motives were noble. But if we are to deal with historical events, we have to keep our minds in tune to the semantics of the age in which those events had occurred, and not how present society would have received them. If we consider the Katipunan purely as heroes and the Spanish colonial government purely as villains, what keeps us from saying that the Islamic extremists in Mindanáo are not heroes? Aren’t they fighting for their Bangsamoro that we Christians “stole” from them? Love of country should not stand on a pedestal of hatred built from a loathing of an oft-misunderstood past. This entry was posted in Filipino History, Identidad Filipina, Imus, Provincia de Cavite and tagged Alen de la Cruz, Alfredo Saulo, Ambeth Ocampo, Battle of Alapán, City Government of Imus, Diosdado Macapagal, Emilio Aguinaldo, Emmanuel Maliksi, Flag Day, Hipólito Saquilayan, Imus Sports Complex, John R. M. Taylor, José Tagle, leyenda negra, Licerio Topacio, National Historical Commission of the Philippines, Philippine Insurgent Records. Bookmark the permalink. One side of my family’s roots is from Imus and to be honest, I’m neither supportive nor against Imus being branded as the “Flag Capital of the Philippines”. But what concerns me is what the local government is planning to preserve the old houses and buildings around town. I have seen several old houses getting demolished in the past few years and there are even some monuments (ex. the monument in Pasong Santol in Anabu) which are not given proper attention. They can give Imus any brand name they want, but Imus will lose its ‘authenticity’ as an old historic town if these things aren’t solved. Hello IMHO. I’ve talked to Mayor Manny Maliksi himself about this issue about a year ago. It appears that he is as concerned as you are when it comes to built heritage conservation. As a matter of fact, he has big tourism plans for Imus. So as far as I know, the heritage houses of this historic city are in safe hands with the current government. But I will still send your comment to the proper authorities there in Imus as a follow-up to what the mayor and I have talked about. Best regards. That is good, if only they would make concrete actions. But I won’t expect anything from politicians. 10 years ago, they renovated the historic plaza. Instead of grabbing the chance to restore the plaza to its original appearance (as it was experienced by the ‘real’ Imusenos), they chose an ugly modernist design for it instead, despite the pleas of some local groups for the restoration of the original design, Thankfully though, they did not touch Gen. Topacio’s monument, at the demands of his descendants (as I have heard, they even considered either altering the monument or demolishing it completely!). And the rest is just politics.